African-American Sheet Music, 1850-1920 - Selected from the collections of Brown University. American Folklife Center (AFC) - Includes over three million photographs, manuscripts, audio recordings, and moving images. It consists of documentation of traditional culture from all around the world including the earliest field recordings made in the 1890s on wax cylinder through recordings made using digital technology. AFC is America's first national archive of traditional life, and one of the oldest and largest of such repositories in the world. Also see Collections & Research Services: The Archive of Folk Culture and Folk Music and Song. Anthology of American Folk Music - A six-album compilation released in 1952 by Folkways Records (catalogue FP 251, FP 252, and FP 253), comprising eighty-four American folk, blues and country music recordings that were originally issued from 1927 to 1932. Aunt Molly Jackson - Influential American folk singer and a union activist. In the mid 1930s, she performed in New York City together with Woody Guthrie, Pete Seeger, Earl Robinson, Will Geer, her half-brother Jim Garland, and her half-sister Sarah Ogan Gunning. Also here. Bob Dylan - Official site. Cockburn Project - Bruce Cockburn. David Rovics - American indie singer/songwriter and anarchist. ezFolk.com - Instructional site for banjo, folk guitar, ukulele, and harmonica. The site contains hundreds of pages of tablature and tutorials as well as the ezFolk Link Directory, with links to over 2500 music sites. Folk Archive Resource North East (FARNE) - Northumbrian music. Access over 4,000 songs, tunes, sound recordings and photographs from across North East England. Folk Music Home Page - Learn all about the musical genre of folk music: the history, festivals, intruments, organizations and more. 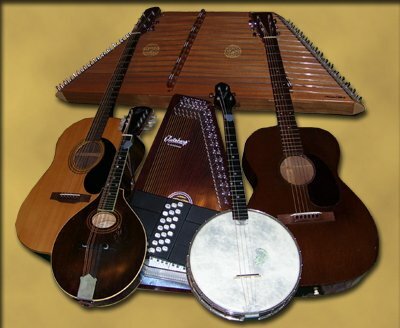 Folkmusic - Provides links to over one thousand folkk music artist-related sites. Folk Song Index - Compiled and maintained by Oberlin College Libraries & Sing Out! Folklife Today - A blog for people interested in folklore, folklife, and oral history. Maintained by the Library of Congress. Journal of American Folklore - The quarterly journal of the American Folklore Society since the Society's founding in 1888, publishes scholarly articles, essays, notes, and commentaries directed to a wide audience, as well as separate sections devoted to reviews of books, exhibitions and events, films and videotapes, sound recordings, and web sites. Leonard Cohen Forum - Official forum of Leonard Cohen Files and Speaking Cohen. Max Hunter Folk Song Collection - An archive of almost 1600 Ozark Mountain folk songs, recorded between 1956 and 1976. Sing Out - Dedicated to the preservation and support of traditional and contemporary folk music from all over the world. Publisher/parent of Sing Out! magazine (since 1950), Rise Up Singing, The Sing Out! Radio Magazine and the Sing Out! Resource Center (a multi-media library covering the last 60 years of the folk revival). Sis Cunningham and here - In the 1930s Agnes helped organize the Red Dust Players, an agitprop theater group, whose members presented short plays promoting political agitation and propaganda. The Red Dust Players performed at union meetings throughout the Oklahoma countryside to educate farm workers, sharecroppers, and tenant farmers on ways in which the union could better their lives. Smithsonian Folkways Collection - Also see "The Folkways Collection," a podcast series of 24 one-hour programs that explores the remarkable collection of music, spoken word, and sound recordings that make up Folkways Records. The series was produced by CKUA Radio in Alberta, Canada and originally aired in 1999. Songs for Political Action - The 10 compact disc box set, assembled by folk song authorities Ron Cohen and Dave Samuelson, contains nearly 300 songs recorded from 1926 to 1953. The complete works of the Almanac Singers, and many rare and unissued tracks of Pete Seeger, Lee Hays, Earl Robinson and other legendary peoples songsters are among the many highlights of this comprehensive set. From the only known recordings of Charles and Ruth Seeger to soundtruck recordings made for the 1948 Henry Wallace presidential campaign, this collection will be the definitive reference for this era in folk music history. A beautifully done hard bound book, with photos and lyrics for all the songs accompanies the 10 disc set. Southern Folklife Connection - Archival resources for the study of American folk music and popular culture. The Be Good Tanyas - Frazey Ford, Trish Klein and Samantha Parton; three women with gorgeous, haunting and plaintive voices accompanied by rustic, sparse and soulful instrumentation, high lonesome harmonies, and intelligent song-writing. Unthanks, The - Known for their timeless, unsentimental and quietly subversive tales of loss, fear, booze, brawls, abuse and sorrow, siblings Rachel and Becky Unthank are honest, young storytellers outside of time, forging links between folk worlds old, new and other. Influenced as much by the minimalist eccentricity of Steve Reich, Antony & The Johnsons, Robert Wyatt and Miles Davis, as they are by their Geordie native North East England, back home The Unthanks have established themselves as the most innovative and critically acclaimed folk band in modern history. Van Ronk, Dave - Also see Wikipedia article. Woody Guthrie and the Archive of American Folk Song - Highlights letters between Woody Guthrie and staff of the Archive of American Folk Song. This webpage last updated on Thursday, May 31, 2018 8:21 AM.